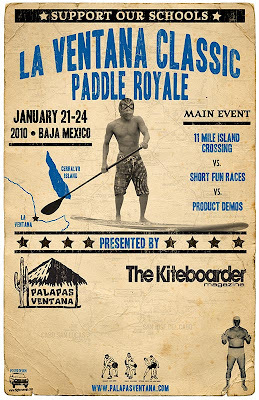 Stand Up Paddle Surfing: Baja Mexico: La Ventana Paddle Royal- 11 mile Island Crossing Race! Baja Mexico: La Ventana Paddle Royal- 11 mile Island Crossing Race! Coming soon! Make plans, build boards, load up yer rigs and head south... this is the one you DON'T want to miss. The scenery's right (pristine southern Baja islands, desert and sand), the water's right (mid 70's, super blue, early morning glass), the course is right (11 mile island crossing as well as sprint races with crowd pleasing beach run, dive-for-the-popsicle-stick finishes) and the cause is right (raise money for the schools of La Ventana). Click here for a full report from last years event (check out how much money was raised for the local schools and see how it was spent)- be sure to check out the "special events" section! But wait there's more! Cold Pacificos? Si! Margaritas frias? Si! Fish tacos? Si! The international airport in La Paz is only thirty minutes from the race course, book it, fly in and get to paddling. I'll be there for all five days of the festival- come have a beer with me. See you down south!